Location: Corner of Middleton Road and Wingfield Place. A Wellington City Council reserve. The Glenside Progressive Assn. 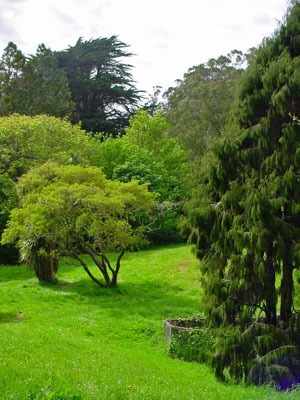 Inc. have asked Wellington City Council to make this historic garden an extension to the Wellington Botanical Gardens. Early settlers to the Halfway area were Thomas John Drake and Ceres Selina Drake, who arrived in New Zealand on the Aurora in 1840. Thomas lived at The Halfway until his death in 1889. His wife sold the farm but retained the house and garden until her death in 1898. 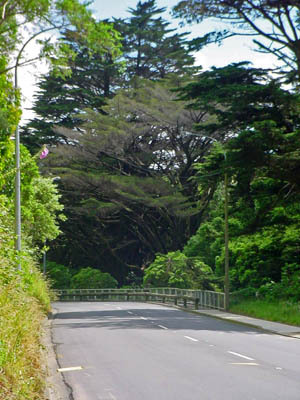 The garden remnants can be seen in the large exotic trees growing on the Drake homestead site southbound of present day Wingfield Place. It is believed that the Romney sheep was introduced to NZ on this property. Some of the hand split totara fencing and posts remain in situ. 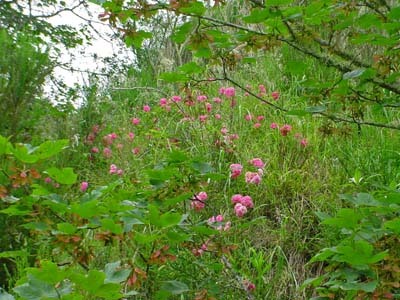 “Grandfather had made a wonderful garden, it seemed to extend for miles with a small creek with many rustic bridges where small trout could be seen… Plants and shrubs came from India sent by Uncles stationed there, including rhododendrons and azaleas from Darjeeling, the foothills of the Himalayan mountains…They had been cared for on Great grandfather Drakes ship and were over a year in transit.” (W Shepherd, Wellington's Heritage, 2000, p 85).